Darren Young is set to “freshen up” his East Fife side after watching them slip to back to back league defeats at the weekend. The Methil men put in an uncharacteristic performance on Saturday as they lost out 2-0 at home to Montrose. The visitors started well and closed out the game, but it was an afternoon when the manager was certainly targeting all three points. 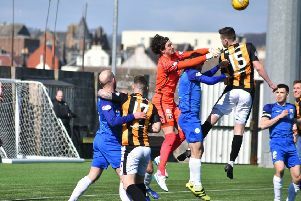 And with a healthy squad to pick from, Young says that it may be time to hand those kicking their heels on the sidelines an opportunity this weekend when Stranraer visit Bayview. “We know we have guys who can come into the team and not lessen the quality,” said the manager. “It may be best to freshen it up a bit. Despite losing their last two league games, the manager is still confident the East Fife squad can hit its quarterly targets. A win over Stranraer will go some way to achieving that, with a trip to bottom of the table Stenhousemuir and then a home game against Forfar to come. “We want 12-13 points from each quarter to keep us up there,” said the manager. “If we get the win at the weekend then we’re still on track for that. “Against Montrose we gave away poor goals and weren’t passing the ball as well as we have been. One big miss from the weekend was defender Daryll Meggatt. Young is hopeful the influential centre half will be available for selection this weekend.